Blurb Description: Its a ZOMBIE KITTEN APOCALYPSE! Should you panic? Should you cry? Should you poop your pants? NO! Just sit back and watch the fur fly as the worlds baddest good guys take on Mad Marmalades meowing monsters! I’ve come to expect a great deal from Aaron Blabey’s Bad Guys series while reading the first three books. They were really well illustrated, simplistically funny and all around fun to read books, even for a teenager. 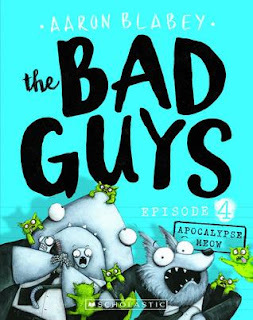 Which is why, the minute after I posted my review for Bad Guys: Episode 3: The Furball Strikes Back, I reached over my bed and picked out my copy of Episode 4, determined to get some laughs into my day. What I found was a good book, but it didn’t click with me the way the previous three books did. I was SO EXCITED for what Aaron Blabey would do with Zombie Kittens eating everything in sight, people included, but the book fell a little short. More than that, there was something missing from the book, and I think I would attribute it to the SAME dialogue happening between the characters, which go along the lines of, “I’m going to eat you,” and “why are we the good guys?” and I sat there waiting for more content. Don’t get me wrong, this series is still REALLY funny and enjoyable, I just feel like with a few changes, the dynamic between characters has remained the same throughout the books. Still, I would DEFINITELY recommend (at least) the first three books in this series! Book five comes out in May and I’m very excited for it. 3 stars. 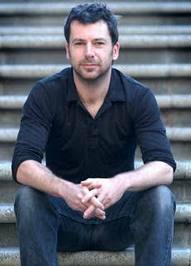 Aaron is an Australian author of children's books and artist who until the mid-2000s was also an actor. His award winning picture books include Pearl Barley and Charlie Parsley, The Ghost of Miss Annabel Spoon and the best-selling Pig the Pug. In the field of acting, he is probably best known for his lead roles in two television dramedies, 1994's The Damnation of Harvey McHugh, for which he won an Australian Film Institute Award, and 2003's CrashBurn, before retiring from performance in 2005. Have you read any books from the Bad Guys series? What did you think of them? What were some of your favourite books as a child? Do you still read any of them? I can't wait to hear from all of you! <3!